Rose and I are closer to starting to try for a baby. I’m down to 1/4 of the dose of hormones that keep my endo and adeno under control. We have a wonderful donor on board. I sleep at night cuddled up to a full body length pregnancy pillow and rub oil into my tummy to prepare dry skin for being stretched. Hope and hopelessness grow in equal measure. “With dreams of a bright future comes also the dread certainty of loss.” You can try to ignore it, stuff it down, run from it, but it will speak to you in nightmares, it will wait for you at 3am, it will shiver in your bones and be a scream that only you can hear, beneath the humming of the world. So we turn, and sit, and face the unthinkable thing. We are trying for a baby, who may die. Three weeks alive, or 6 months, full term stillborn, early death, accident, terminal illness, disappearance, suicide. To love on this earth is to open your heart to the guarantee of grief. My darling Rose has suffered the loss of six pregnancies. Each deeply desired, dearly loved and hoped for. Each child dreamed of and nurtured with everything that she had. Sometimes love is not enough. Rose and I have struggled with grief. We’ve had very different needs and approaches and experiences, and this has torn us apart at times. We’ve navigated the loss of friends to suicide and sudden death, the anniversaries of miscarriage, loss of friendships and relationships dear to us. We’re been given many shadowed days to begin to understand each other in grief, to sit with the terror, and start to find our own ways through. We have often grieved alone. Grieving together with a partner or in a family is different. Denied grief, overwhelming grief, grief that shatters lives and tortures the mind is something we’re both familiar with in different ways. We know we’re vulnerable. Everyone is vulnerable. Our culture often isolates the grieving. We do not speak the names of the dead, we do not know what to say, we visit avidly in the first month and when we’re most needed in the 6th month when the shock has worn off we’ve moved on to other pressing matters. We’ve pathologised much of the process of grief, and presented ideas of joy and sadness as being opposite poles a spectrum rather than separate, legitimate, and overlapping responses to life. Ask anyone who has lost a close friend the same week they gave birth to a child. Ask anyone who has fled an abusive relationship and grieved the loss of their hopes just as intensely as they experienced joy in their freedom. You cannot ever be really ‘ready’ for loss, because when we think of this idea of being ‘ready’ we picture someone who will be unaffected and unchanged. This is not how grief works, any more than it is how love works. It changes everything in us and in how we see our lives. Some things suddenly become meaningless while others are lit up in the most intense way. You cannot be ‘ready’ when this is what ready means to you. But you can certainly be set up to fall hard. Beliefs such as ‘if god/the universe takes my child away it’s because I was not going to be a good parent to them’ will cause terrible suffering. The way losses are explained can ease or deepen pain. Rose was once told by a doctor “your body is killing your babies, we don’t know why” which left her distraught and suicidal, with terrible self hate and conflict. Later on, coming across many other explanations for miscarriages, including things like “sometimes there is a problem and the body cannot sustain a pregnancy” or “sometimes babies are not put together right and they die early”, there were other ways to understand what had happened that were not personal and didn’t indicate intent to harm. Not so long ago my sister’s beloved little cat Kiki died suddenly. It was horrible and a huge loss to her. It brought to mind our families rituals of grief around pets. 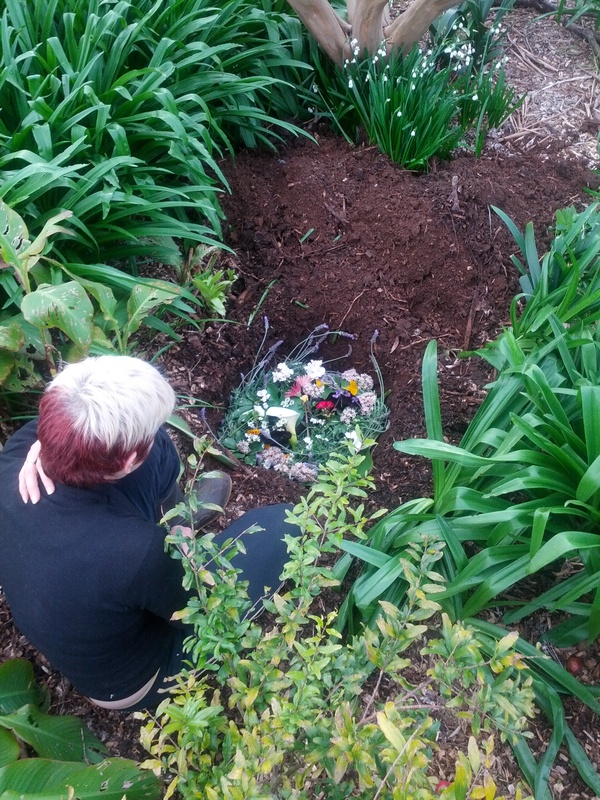 Whenever a pet or rescued animal dies, we’ve always buried them in our yard. Sometimes wrapped in a cloth or placed in a box, but always in a grave that’s filled with flowers and leaves from the garden. We don’t permanently mark the graves, although we do often place rocks or tree stumps over them to keep them undisturbed. The gathering of the flowers has become a very gentle way of returning the bodies to the earth, of connection with the cycles of nature. Pippi and Tessa, my darling rats, were buried under winter lillies. Charlie under autumn leaves and the last of the roses. Kiki under snowdrops. There’s something much gentler about heaping earth onto the plants instead of directly onto a body. Rituals and other things that mark the loss can be deeply important but also difficult to come up with in the shock of grief. Having a history of them can give us a connection to other losses that’s both painful and encouraging, raising past pain but also reminding us that this is part of life and that there will be new joys. In early miscarriage there’s often the challenge of not having a body to bury. A ritual such as placing flowers, visiting a tree, lighting a candle, or choosing a date to remember the ones who died can all give a ‘home’ to the grief. In infertility, likewise there is no defining moment or ritual to share. When a previous long term relationship of mine became abusive and broke up, I grieved the children we’d planned together, but I grieved them silently and alone. Grief consumes us with loneliness when we cannot share it, and without a place, date, or name, we don’t have the language to. People have found ways to work with this. I named the child I’d been planning for and wrote them poems. I lit candles for them when I felt them near and the grief was strong. Rose and I are collecting two lists of baby names, one for living children, and one, pretty but impractical, for any that die. I’ve found an Australian Not-for-Profit called Heartfelt who provide cameras and other services to families who’ve had a stillborn or terminally ill infant. I’ve come across other unconventional ways to mark loss such as this photoshoot of a wedding prevented by death of the groom to be. I’ve read about death and loss and grief, and watched heartbreaking documentaries such as Losing Layla and the follow up Regarding Raphael. I’ve come across instructions on arranging the funeral for a baby, and how to get a certificate acknowledging the loss of an early pregnancy. I’ve found a local funeral company who are creative and flexible and offer home funerals, The Natural Funeral Company. We’re still not ready. It’s not possible to be ready. But it is very possible to be in denial, under-resourced, inexperienced, and paralysed by fear. That, I’m determined not to be. Grief can destroy relationships. Rose and I hope to journey together, without regrets, whatever the outcome. We walk into the future, full of hope and fear and love, death in one hand and life in the other.